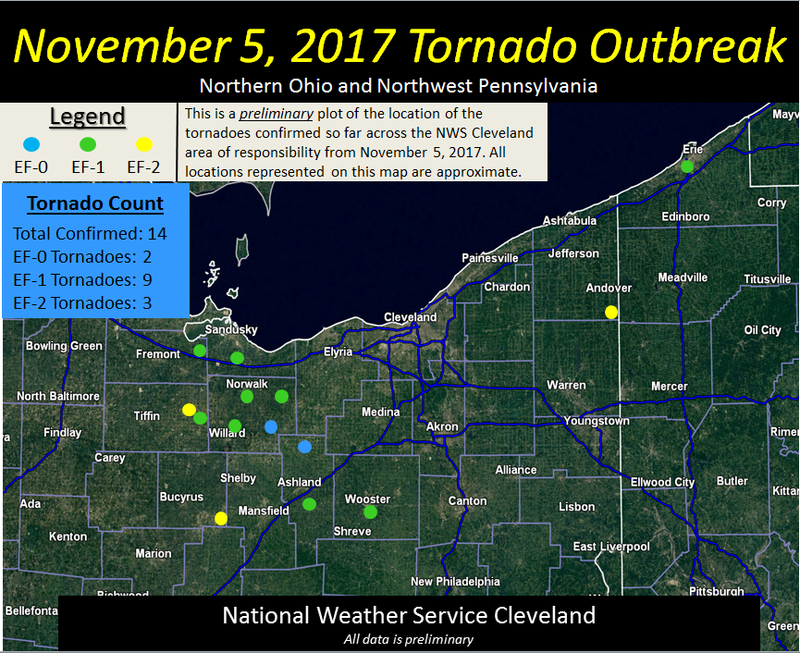 Northeast Ohio experienced eight tornadoes and straight line winds on Sunday 11/5. Unseasonably warm weather setup the potential for severe storms as a strong cold front moved into the area. Due to loss of electrical power, Internet, and phone service from Sunday 11/5 until Thursday 11/9 there will not be any new content on NeutronBytes until next week. Cleveland television Station WKYC News reports (video) that the National Weather Service is investigating Sunday’s storm damage to determine how many tornadoes impacted the area. As of Monday evening, the Weather Service confirms eight tornadoes within the Cleveland forecast area (including northern Ohio and western PA). This type of weather is unseasonable for this time of year. 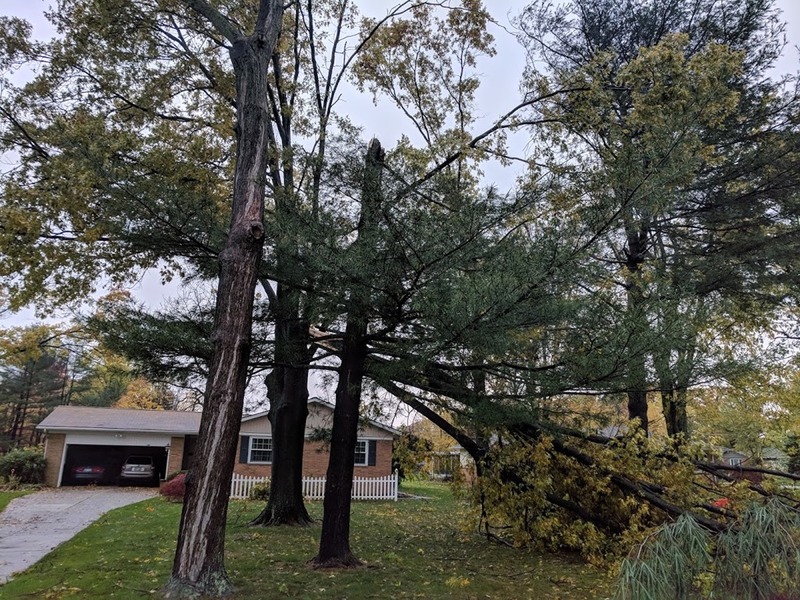 It was caused by the impact of a strong, fast moving, cold front hitting warm moist air that had been hovering over northeast Ohio for several days. The Weather Service also says a macroburst of wind hit Williamsfield in Ashtabula County, located 60 miles east of Cleveland, (map) with winds up to 125 mph. In Macedonia, OH, located 25 miles southeast of downtown Cleveland, (map) a local weather station reported winds of up to 104 mph causing extensive damage to homes and businesses. The high winds literally cut tress in half toppling matures oak and pine trees like they were match sticks. The pine tree in the center was clipped in half and the oak tree behind it was split into several pieces. The Cleveland Plain Dealer reported that 37,000 people lost power due to the storm. Lightning strikes started several fires. Several Interstate highways were closed for periods of time due to high water.